I’ve been asked a couple times to give a talk about caving at a Venturing Roundtable for the Pennsylvania Dutch Council, BSA. I finally got it on my schedule without conflicts. As it was only a 45 minute drive I should have done a talk for them sooner. Damian and Gretchen came along to help me out and learn more about these cave talks. The challenge is that each talk is different. Each is catered to the specific group I’m talking to and their interests. I don’t usually know all this until I see them and start talking. Some of the material I plan on getting across is the same for all groups. Safety, biology, geology, LNT, land owner relationship are the basic topics. How much I cover on each and other topics depends on the group’s interests. If I see eyes glazing over I change topics and go onto something more active. If they start asking specific questions, I spend more time on that subject. These folks have their Venturing Roundtable then break off for a Venturing Officers Association meeting for youth and the Venturing Committee meeting for adults. After my talk I had an opportunity to talk with a few of the adult leaders and just hear what their interests are. One Crew was into shooting sports and another was into extreme geocaching. My Crew is definitely interested in both of those activities and will be looking at planning weekends with them and exchange activities. 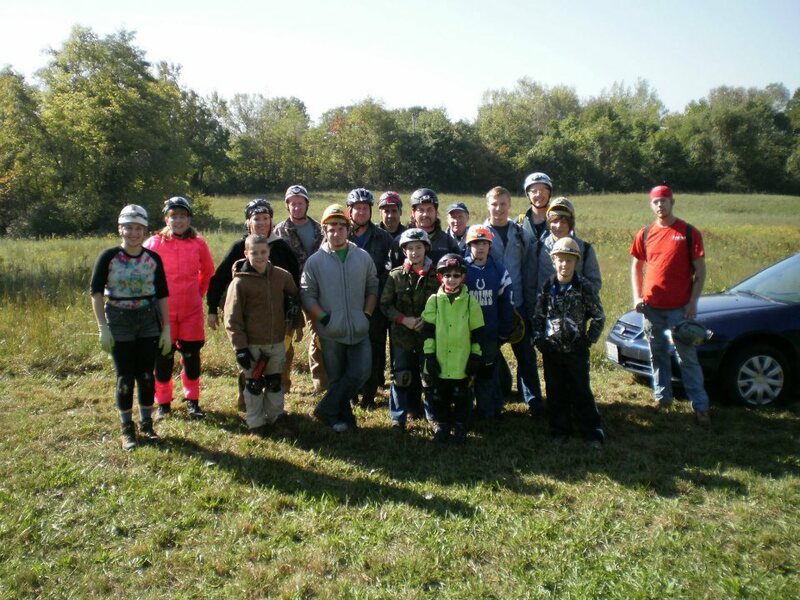 It was a great turn out. They had something like 30 people there. 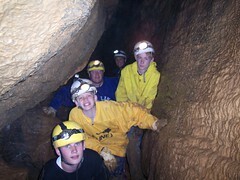 Hopefully we’ll get some interest in caving and maybe even the Cave Exploring Elective for Ranger Award. If you have any comments, please leave them below. I do try to reply to as many as I can. Also, in the upper right hand column, subscribe to the YOUCave newsletter and get each new post in your email inbox. And share this with your friends with the links below. AT FIRST, THERE WAS NOTHING BUT DARKNESS. THEN, I TURNED ON MY HEADLIGHT. This is just a snip from the blog. Please follow the link for the full story and find the time to donate to help this happen. There is a pair of caves on a property that we use to go to regularly. Because of their beauty and the fun trips we had they were very special to me. A few weeks after the last trip there many years ago one of our Grotto members had driven by and there was a “No Trespassing” sign posted with a chain across the drive. The property had been sold and the new owners didn’t want anyone on the property any more. Several years had gone by with some negotiation with the land owner and a tentative Memorandum of Understanding was being considered. 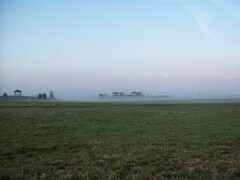 Then the land owner sold that piece of property to a farmer and new negotiations had start up. Almost five and a half years later and we have a tentative permission to enter the property and the two caves that I’ve missed exploring and sharing. Jumping at the chance I secured a date and received permission to enter. I invited a few of my friends from Philly Grotto and Dragon Breath Grotto plus a couple people from another Venturing Crew. We have a caving trip in the making. One of the caves is not very technical, but for some people the entrance is a bit tight. I wanted to take my two grandsons to see this cave, at least this once, in case it gets closed again. We divided the group into two different groups. One had the younger kids, Andy and I lead that group. The other had the older, high school aged, kids. Amos and Marcy lead that group. The original plan was to swap caves after we had finished exploring the one we were in. Funny how plans don’t always work out. I started my slide into the 12 inch entrance with 4 kids stacked up behind me and another adult in the rear. Once inside I was getting the kids situated and comfortable I hear a lot of discussion at the entrance and Andy came in. Two of the adults, who will remain unnamed to protect their anonymity, decided the entrance is just a little tight for their taste. 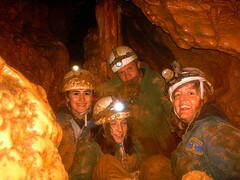 How Young is Too Young to Start Caving? Andy and I are in the cave with another adult, Sandy. This was her second cave and she was loving it. We had my two grandsons, Zahne (9) and Aidan (5). This also was Aidan’s second cave. Zahne has been caving with me for about a year and a half and is very comfortable underground. 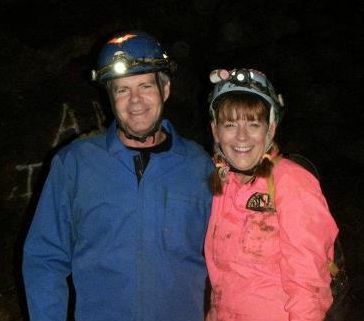 This was Bridget’s (5) and Dominic’s (8) first caving trip and they were both very excited and wanted to see everything. A little later we picked up Kevin from the other group as he was a little uncomfortable with the more technical entrance of that cave. 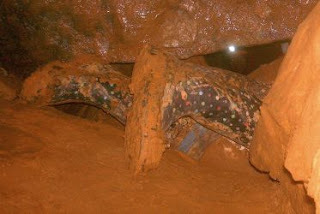 For Those Who Think Caving Is Too Scary and Dangerious for Kids. You would have thought it was Christmas the way these kids were acting. They were so excited about seeing every part of the cave and sharing it with each other. One of the things I like about this cave is there are no real dangerous drops or holes they can fall into. We can let them explore and experince being the first one in a dark passage without worrying about them. 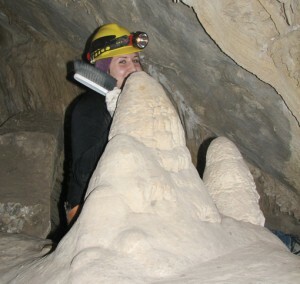 There is also a good variety of formations that they could discover and look at up close. Little drips coming off the “soda straws” and moisture on the columns. 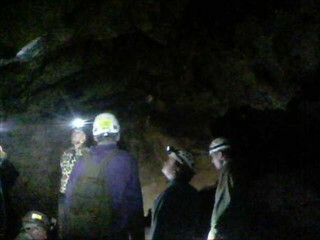 They got to see, feel, smell and hear what a cave really is like, first hand, up-close and personal. And they got their picture taken a lot. We eventually did work our way out and back up the entrance. Of course the adults had a little more difficulty than the kids getting out that little opening. We were generally all tired and it was starting to get a little late. We decided to skip the cave swap and call it a day. Some from the other group were already out and waiting. A little while later the rest of them came out tired but excited. This is why I like to take people, especially kids, to see these caves. They are spectacular and leave a long lasting impression on them how fragile and beautiful the cave eco system is. Now we just need to plan when we can get back and swap caves. Here's the rest of the album. Andy's album is here. Amos's album from the other group is here. Please leave a comment, subscribe to YOUCave and share this with your friends. 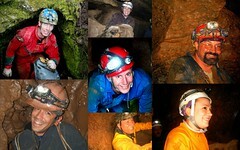 I received an email this morning from a caver friend from another Grotto in our Region. Apparently he had to make the tough decision to cancel a trip for a Boy Scout Troop because he didn’t feel comfortable with what “This Guy” was trying to get his Grotto to agree to as part of a caving trip they were planning to take in a week. “This Guy” was trying to get around the Guide to Safe Scouting section on caving and the BSA Caving Policies. 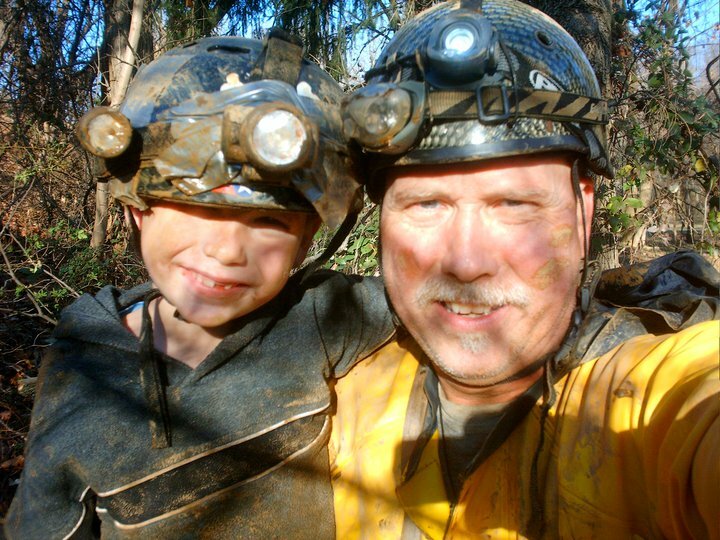 The Guide to Safe Scouting and the BSA Caving Policies are there for a reason. This helps the Unit Leader understand what is considered safe and acceptable for them to do with the youth he or she is responsible for. Every time this comes up I think about what it would be like to tell a parent that their child has been injured, even worst, won’t be coming home. I think about how I’m going to explain to a litigator while on trial why I knowingly didn’t adhere to the Guide to Safe Scouting and an accident happened resulting in the injury or death of a child. The BSA Caving Policies are not there to make it difficult for a Troop to get underground, but to keep the kids safe and to let the adult leaders know they are doing everything in their power to do that. What disturbs me even more is not just that this leader tried to get around the policies, but a few weeks before he had contacted me about the same trip. I gave him the same information and the same instructions. I guess he didn’t like my answer and decided to try someone else to see if he could get his way. Just like other high adventure activities, the communities in those activities are tight and talk to each other. Unfortunately “This Guy” has started a not so pleasant reputation for his Troop. Unfortunately this is all that’s needed for some folks in the caving community to see all Scouts as being this same way. As a Scouter myself I find this disturbing. I know that I’m preaching to the choir and that those who read this blog are very conscientious about sticking to the rules and having a safe and fun trip. But we all know someone who has the potential to be “This Guy”. Please, take some time and share this story with them and tell them to not be “This Guy”. Please leave a comment below. I do try to answer all questions and comments. Subscribe to YOUCave and have current posts delivered to your email in box. Click on the boxes above and share this with your friends and join us on Face Book and Twitter. This is a continuation from The Phenomenon Part 1: A Day With the Squeeze Box posted a few weeks ago. I wanted to do something special on this trip for the kids who decided to go with me to the Phenomenon. Being as we’re in Virginia I thought it would be nice to explore a cave that we haven’t been in before. Well ahead of time I tapped my network of cavers to ask around if anyone in VA would be interested in taking us to a beginner cave. Eagerly the call was answered by Tom Tucker, Ellie Florance, and Earl and Cheryl Suitor from Front Royal Grotto in Virginia. We made arrangements to meet them at the Skyline Caverns parking lot and explore Allen’s Cave which is just next to the commercial cave. Man did it rain Saturday evening and through the night. Nothing washed away, but I did find I have a leak in my tent that needs to be patched. Sleeping was a little uncomfortable. Instead of a good night’s sleep I’ll can it a really good nap. Just like the day before everyone was getting up one at a time. The rain was holding off and together we all made it to the dinning hall for breakfast. We grouped and talked about how we were going to pack up and check out of camp. 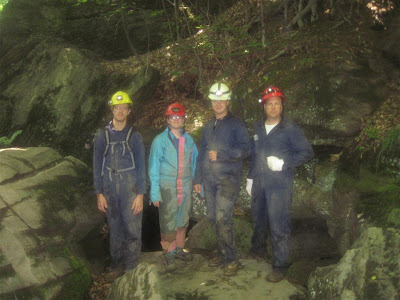 We were still lucky with the rain and packed up all the gear, said our good buys to the rest of the contingent and Martha, Stephen, Damian and I headed to Front Royal to do a little caving. That’s when the rain started coming down again. By the time we rode into Front Royal it was a little after 11:00 AM and we were hungry. We did a quick stop at McDonald’s for lunch and ate in the car as we looked for our new caving friends. Just down the street we met up with them and made introduction. It was a lot drier in the lobby of Skyline Caverns. They let us have a corner and Tom pulled out a map of Sky Line and Allen’s to show how they were related. Tom also talked a little about the history of the cave and the signatures we’ll find in there. We jumped back in the Cherokee and followed Tom and the others up a little trail and parked to get suited up for the cave. Yes it was still raining and changing was miserable. We managed to keep most of our cloths sort of dry. I had a few extra coveralls, helmets, lights and gloves for Martha, Stephen and Damian in hops that they would be comfortable and enjoy the trip. A short 100 yard walk in the woods and we came to a hole in the ground. The cave is gated and Tom had the key. It was an easy entrance and you can see why it was thought to try to commercialize this back in the 1800s. Some it was leveled out to make it a little easier for “guests” of the time. There were a couple spots where we did have to climb with the aid of ladders which were there in place already. Some of the cave was dryer, but you could see how beautiful it must have looked long ago with the rim stone pools and flow stone. Parts of the cave were wet and still growing. White calycle deposits from within the last 50 to 100 years were evident and the mud was slick. As the kids were going off to explore the “Ballroom” Earl showed me were they were going to come out. It was a short 10ft drop to end of the passage. He hooked up a hand line and I body rappelled to greet them. We all migrated back to the “Ballroom” and looked at all the signatures on the walls. Some of them dating back to the 1800s and 2 of those were solders from the Civil War. It was awesome to look around and absorb the history of this place. This is a place I would highly recommend anyone to see if they get a chance. It’s not a difficult cave and lots of open walking passage. It was getting close to 2:00 and we have a 4 hour drive back to Honey Brook ahead of us, so we had to cut it short there and head back out. It was still raining and managed to get changed back into our almost dry cloths, repack the Cherokee and said our good buys to Tom and his team. Except the pounding rain the drive home was uneventful. Everyone else slept as we passed through West Virginia and Maryland. We dropped Damian off at his house and Stephen and Martha off at her house. I was home a little after 7:00 PM very tired, wet and hungry. It was a great trip. One that will stand out in my memory and I hope it will stand out in theirs. It’s going to be a few days if not a week before I can clean and dry all the gear. This was definitely worth it. For more pictures please visit the photo album here. Please leave comment, sign up to get future blog post delivered to your in box, and share with your frineds. This is Dave's post number 3 on CaveSim. It expresses the need to get CaveSim on the road to outreach to people. It started off as a simple idea. 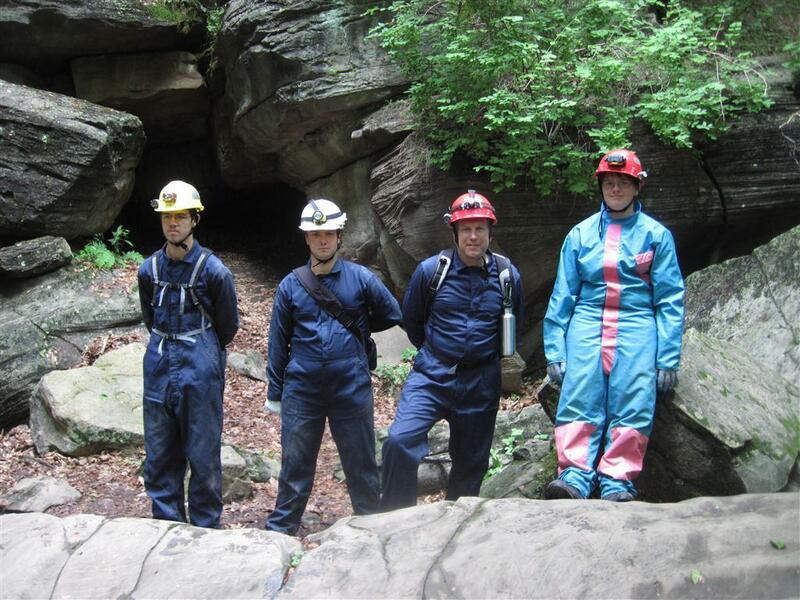 The Chester County Council VOA wanted to take the Squeeze Box to the North East Area 6 Venturing Phenomenon to promote caving as an activity they like to do. What could be more fun? Getting to talk to a mess of kids about how much I enjoy crawling in the mud in a hole in the ground. Actually this is quite flattering. Some of these kids I took caving like it as much as I do. So they invited me along on their Area 6 activity to help them with this project. The shout went out to other Crews to see who wanted to go. Once we got our final head count our contingent Crew was made up of Catie McEntee, Allison McEntee,and Elsye Mark from Crew 23 of Downingtown, PA; Katrina Berry, Liane LaPorte, Emily Giacomucci, Christine Nguyen, Barb Grover and Bill LaPorte from Crew 94 of Peonixville, PA; and Martha Giammusso, Steven Rhoads, Damian Paterno, and myself, Allen Maddox from Crew 9 of Honey Brook, PA. The VOA set this all up. I didn’t have to do much. Drive and supply the Squeeze Box. Easy..
Oh wait, what or who is the VOA? The Venturing Officers Association is a collection of officers representing the Venturing Crews in the Council. Each Crew has a President and they all are illegible to participate representing the interests and abilities of their Venturing Crew. The “Youth Leaders” are the ones who spearhead and run the VOA activities and this Area 6 Phenomenon. Fast forward to getting there, we all met up at the Morganotwn exit of the PA Turnpike to go west to Rt 15 south then on to Virginia. We did stop for dinner on the way down, invading and getting seating for 12 was not all that difficult at a Cracker Barrel. Later on we called ahead when we crossed the PA /MD border to make sure the gate to Camp Snyder was going to be open for us when we finally arrived a little after 10 PM. After we cleaned up the paperwork for registration we started setting up tents and finished pitching camp by midnight. By this time everyone was excited but exhausted and ready to get some sleep. I found it difficult to sleep and woke up early Saturday. I decided to take a walk back to the parking lot where I left the Cherokee with the Squeeze Box on top and gather some paperwork and look over the day’s schedule and see if I could figure out where we were suppose to set up. It was still a little foggy which made everything seem further away than it actually was and hard to make out which landmark was our location. I walked back to camp with my papers and there were a few other people up anxious to get started too. Eventually everyone was up and we all headed for the dinning hall for breakfast together where we saw just how many people were at Snyder. I’d say easily 200 Venturers were there waiting to eat and get started for the day. As the announcements for each activity was made you could hear whispered discussion from different groups of, “wow, I’m going to try that” and “this is going to be awesome”. Click on the image to see the whole photo album. After breakfast everyone from our contingent was helpful unloading the Squeeze Box and the gear and we ran through real quick how it works and everyone had a chance to try it before other groups started arriving. New comers always look at it with that “what is that” look. It’s tough to explain and showing how it works makes it look real simple. Then they try it. That’s when they get it. Something so simple is so much fun, not only to do but to watch people struggle with the challenge of getting as small as they can while moving from one point to another. From then on we had a steady stream of people wanting to try it. The box went up and down several times as new people arrived. Several people stopped back to see if anyone broke their record. A couple times it was and they would try a smaller squeeze to match then beat it again. By lunch time we had two people who did 6 inches, which was the standing record so far for 14 y/o and up. The challenge was announced at lunch that we had a 2 way tie at 6 inches and anyone who thought they could tie or break the record should stop by our station after lunch. I didn’t even get back to the station after lunch and there was a small group starting to gather. The afternoon went pretty much like the morning. Non-stop flow of people stopping by to try the box and see how small they could get. There were a couple surprises during the whole day. A few rather muscular guys did squeeze down well below 7 inches. A couple actually made 6 inches. But we did have a new record in the afternoon. A 16 y/o young lady did 5 and a half inches. Wow. Up until now less than 6 inches was unheard of. Several people who stopped back tried to tie but no one else came close. We were lucky with the weather. We were closing up at 4:00 as the clouds started rolling in and you could feel the temperature falling. It actually felt nice on my sunburn from sitting out in an open field all morning and then the afternoon. Everyone from our contingent pitched in again and helped get squeeze box and all the gear back up on the Cherokee and strapped down before dinner and the rain started. Overall it was a fantastic day of showing off a caving skill to over a hundred people and there was nothing I would have changed, well, except maybe to use some sunscreen. 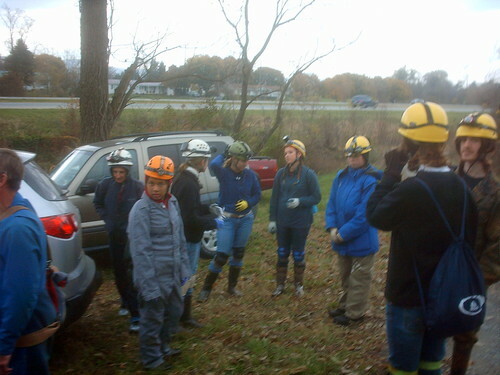 Watch for The Phenomenon Part 2: The Caving Trip coming up in a few weeks. As always, please subscribe to this blog, leave a comment (I always read and reply), "like" and share this with your friends. Caving From 8 ‘til Midnight. Work Be Damned. 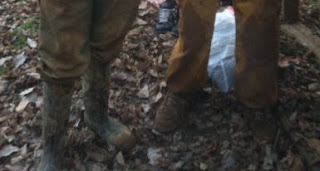 Matt contacted me some weeks ago saying that he had some workers around the Dickinson College Farm who were interested in caving. He wanted to take them to “that cave by 81” that Franklin County Grotto folks had taken him to some years ago. After asking a few questions I figured out that he was talking about Peiper Cave. So we began the process of narrowing down a date. Once the date was set and arrived we had to deal with Matt’s last minute realization that the student workers were on the schedule to work later than usual on this day. Matt’s partner at the farm would not let them out early, so our departure was pushed back from 6:00 to 8:00 on a Monday evening. Really I have a hero to give props to. Nathan MacLane, new member of the York Grotto, came with me on a Boy Scout Caving Trip this Saturday. On a whim I called him 10:00 this Monday morning to ask if he wanted to go caving tonight. He said he’d think about it, but called me back half an hour later telling me that he was in. As the phone chain goes, Matt called me telling me that they would be an hour late. I called Nathan, who had already left to meet us in Shippensburg, to tell him that we would be an hour late. Nathan made it work. Maybe he doesn’t get the hero award. Maybe he gets the “chill-axed,” crazy-cool, laid back award. Getting to Peiper Cave in the dark was a little more complicated than I gave it credit for. I turned our car caravan down the wrong dirt lane. I started to drive past the correct dirt lane. But we got there in one piece. I noted more spray paint inside / on the artificial wall, but nothing new in the cave. We entered and went up the rock scramble to the left where I let the group do the leading and route finding (as they had maps). I promised a snickers bar to anybody who could definitively point to where they were on the map. I heard it several times through the trip, “I’m definitely not getting a snickers bar,” or “Chris, your snickers bar is safe.” We stuck together mostly as a group as we ventured up and down the Swiss cheese-like halls. We ventured into the sub-floor and squirmed through the Catacombs. We had a pretty good 4-hour tour of the cave. There was certainly plenty that we did not see, but it’s good to leave a cave wanting more. Matt said to me, “Every time that I go caving I want to do it more.” I love hearing that. I bet we’ll see this group out caving again by summer. Back at the entrance room we tried our hand at the Slot, but I asked that we make our way out of the cave because I had to work on Tuesday, and staying in past midnight seemed overkill. Daniel took a great photo of Heather as she was going through the Slot. I hope that we get a copy of that. Everybody left the cave excited about the trip and looking forward to telling everyone that missed it that they missed out. 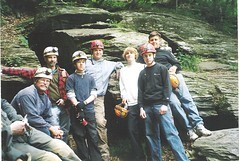 Somewhere around 2002 I started helping to guide caving trips for Boy Scouts through the Philadelphia Grotto. With my history as a Scoutmaster I had experience dealing with Scouting issues. I just needed to develop my caving chops, and my friends in Philly Grotto where helping me do that. 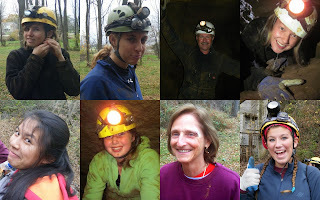 After a couple years and some very successful caving trips with the Boy Scouts one of the women in the Grotto asked, “Why don’t you take Girl Scouts caving?” The only answer I had was, “Because they don’t ask.” I had to look into this some more. Generally, caving at this point is a male dominated activity. There are some women in the grotto, but it is mostly guys. Maybe that has something to do with it. I went on line and looked around for local Girl Scout Troops that I might be able to talk to about this. HHmmm, that’s not that easy to do. I asked everyone I knew to ask around for an introduction to someone involved with the Girl Scouts. Apparently there’s a mistrust of some old guys saying, “Hey, you wanna take your girls caving?” It’s just a little too, how do they say, “pervy”. There were a few things I had to learn along the way. One is the language. Just because it’s Boy Scouts of America it does not make it Girl Scouts of America. It’s GSUSA (Girl Scouts of the United States of America). And Boy Scouts are “chartered” (or franchised) and run by community organizations. Girls Scouts are all solely part of a larger Girl Scout organization called Service Unit (SU). While women can be Scoutmaster in BSA, men cannot be the number one Troop Leader in a GSUSA Troop. Starting to learn the lingo helps, a little. It took some time but I did get my foot in the door, so to speak. 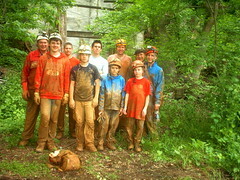 Of course this was with the help of some new caving friends who were also GSUSA Leaders. 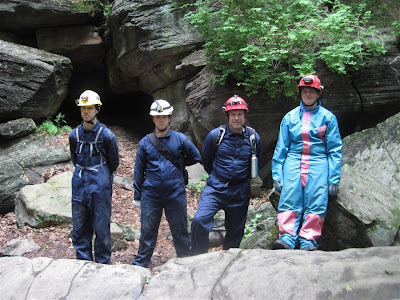 I still have not taken a GSUSA Troop caving, but I have helped a Troop to go caving which opened the door for other outdoor possibilities for them. This is all great stuff. But in the meantime I’m still taking more and more boys caving through their BSA Troops. Then the Venturing Program started to catch on in my Council. 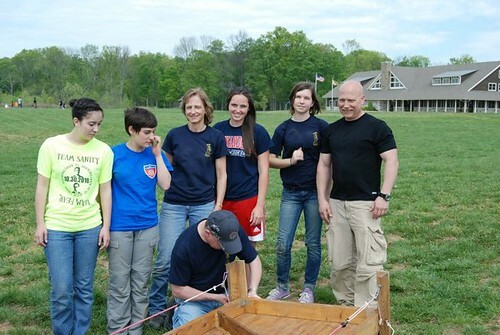 GSUSA girls starting joining BSA Venturing Crews to do high adventure activities that were not available to them, for one reason or another, through their GSUSA Troops. 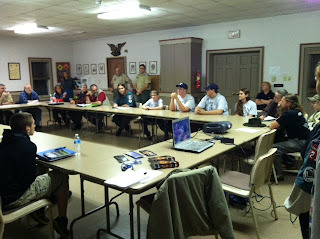 There were a lot of guys in the Venturing program already. Mostly they were guys who were board with their Boy Scout Troops. They needed to do things that their 12 y/o little brother could tag along with them on. 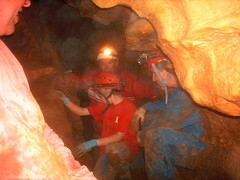 Caving is one of those activities that BSA deemed to be age appropriate for 14 y/o and above only. 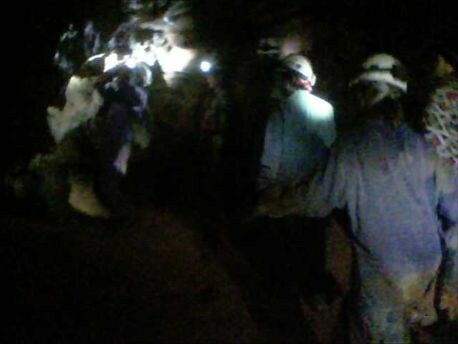 This tailored caving to be a good activity for a Crew to look into trying. As more and more Crews tried caving the word spread and I was invited to talk to more Crews and Troops. 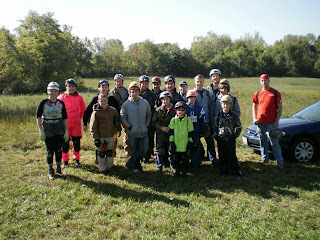 A few of us even formed our own Venturing Crew. We did even more caving. 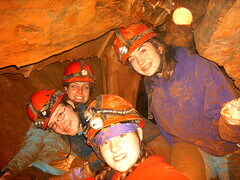 It was a good mix of girls and guys, but mostly guys still doing the caving and other high adventure activities. Then something changed. I’m still not sure why. I don’t even want to speculate. But it is worth noting and maybe looking to see if this too changes. 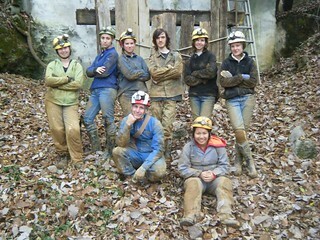 This past year, 2011, caving activities have been joined in by more and more girls. And they enjoy it and are very good at it. Maybe it’s that not one body type is good at all caving. Maybe it’s that there’s something in caving that pretty much everyone can enjoy. Maybe it’s the great staff of friends I have from all ages of both men and women that help run these trips. Maybe it’s a combination of all these and more that just level the playing filed so caving is enjoyed by may different types of people. I guess there is one common trait among such a wide variety of people. That’s a strong sense of adventure and having fun even in adverse conditions. Also being able to develop a team mentality with the people you are with, no matter who they are. Not competing against, but playing with the folks in your group to have a good time and explore new realms. 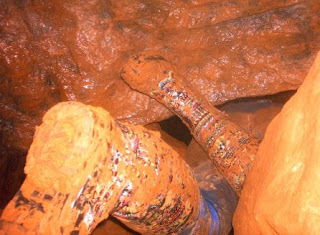 Either way, all my new friends from the Troops and Crews we’ve been getting underground are spreading the word about how much fun caving is. You don’t have to be tall; you don’t have to be short. You don’t have to be old; you don’t have to be young. You don’t have to be guy and you don’t have to be a girl. Caving is for everybody. Please enter your email address to subscribe to YOUCave blog posts in your email, make a comment below and click and share with your friends. I met up with Amos, Andy, Marcy, Hanna, and Dave at McDonald’s. The day started out sunny but rain is in the forecast. It wasn’t long till the rain started and the driving was a little less than ideal. Along the way Hillary called and said she’d be meeting us there. We met up with Michael and the rest of the Westtown gang at a rest stop along the way. We talked a little and introduced ourselves to everyone and they introduced themselves to us. A few of them had been on our trip last year and one had done a little caving up in New York. But most had never been underground before and were looking forward to trying this. When we got to the cave it was still raining though not as hard. It was enough to make getting changed a little miserable. We suited up and we all met up in the cave entrance where it was just a little drier, we did a check of helmets and headlamps and all the light came on. Onward through the entrance and the first little squeeze. This is always great to see how the newbie’s move and negotiate this. There were a couple helmet issues which were quickly corrected. Up to the top of the Breakdown Room to get adjusted and divide into groups. 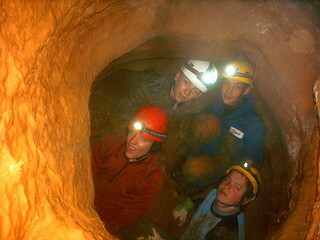 We had enough cavers to split up into 4 groups. And off in different direction we went. Hillary and I lead the “slow” group with Michael, Andy, Caleb, and Eli. Caleb and Eli were defiantly not slow and pushed everything we went to too. Caleb and Eli even went around and did a couple more loops while the rest of us were squeezing through. Later on we met up in the Break Down Room and had lunch and talked. A few wanted to take a personal break and go back to exploring. A few chose to quit for the day. So we regrouped and went in and explored more of the cave. I think that over all we all saw most of the cave. We coordinated to meet back outside at 4:30 and changed back into our dry and clean cloths. Well and dry and clean as we could for a raining afternoon. Michael and I talked about doing a more advanced cave for a smaller group of kids who have done this trip a couple times already. Maybe something in the late Fall or Winter. As always Westtown has great kids with a great sense of adventure. I hope to see them and maybe some new kids next year. You never know, maybe even see a few a Grotto meetings in the future. Please subscribe to my blog, leave a comment below, and share this with your friends.